Watch how "BLUE WHALE"game effects Indian Teenagers. The Blue Whale Game also "Blue Whale Challenge", is an Internet "game" that is claimed to exist in several countries. 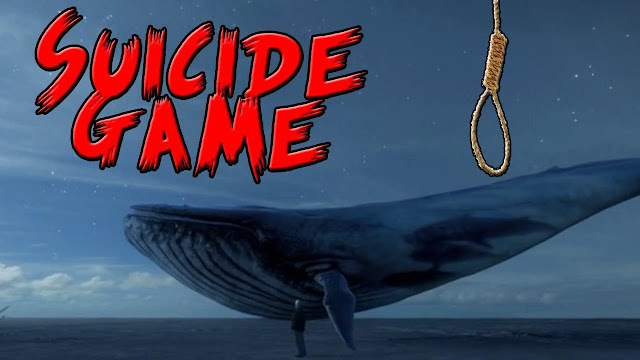 The game allegedly consists of a series of tasks assigned to players by administrators during a 50-day period, with the final challenge requiring the player to commit suicide.The term "Blue Whale" comes from the phenomenon of beached whales, which is linked to suicide. Blue Whale began in Russia in 2013 with "F57", one of the names of the so-called "death group" of the VKontakte social network and allegedly caused its first suicide in 2015. Philipp Budeikin, a former psychology student who was expelled from his university, claimed that he invented the game. Budeikin stated that his purpose was to "clean" the society by pushing to suicide those he deemed as having no value. In Russia in 2016, Blue Whale came into broader use among teenagers after a journalist brought attention to it through an article that linked many unrelated suicide victims to the Blue Whale, creating a wave of moral panic in Russia. Later, Budeikin was arrested and pled guilty to "inciting at least 16 teenage girls to commit suicide", leading to Russian suicide prevention legislation and renewed world-wide concern over the Blue Whale phenomenon. It has also been linked to other rising self-harm trends, such as "human embroidery" in China. The game is based on the relationship between the challengers (also called players or participants) and the administrators. It involves a series of duties given by the administrators that players must complete, usually one per day, some of which involve self-mutilation. Some tasks can be given in advance, while others can be passed on by the administrators on that day, the last task being suicide. The list of tasks, to be completed in 50 days, includes waking up at 4:20 A.M., climbing a crane, carving a specific phrase on the person’s own hand or arm, doing secret tasks, poking a needle to the arm or leg, standing on a bridge and roof, listening to music, and watching videos sent to the challengers by the administrator. One of these music videos was originally for Norwegian singer Emilie Nicolas' upbeat song "Pstereo" (filmed in Scotland). It had been dubbed by the administrator and set to BENY's hauntingly somber remix of Australian singer Sarah Blasko's country-folkish song "All I Want" (video filmed in Victoria, Australia). 1. Kerala: A 16-year-old from Kerala, fell victim of the dangerous dare, according to his mother. Manoj, the young boy was found hanging in his home on July 26. While, the family had initially told the police that the suicide was a result of failed relationships and scoldings by his mother, just three days ago, the boy’s mother filed a fresh complaint, saying the Blue Whale challenge could be a reason for his death. In another case in the state, an IIT student who committed suicide in Kannur last May reportedly used to play the deadly game, according to Manorama Online. 2. Maharashtra: A 14-year-old boy jumped off from the seventh floor of a building in Mumbai on July 26 evening is another suspected case of Blue Whale suicide game. The deceased, Manpreet, was a class nine student in a school in Andheri East. While locals said he played the Blue Whale game, the police said they are checking Manpreet’s cell phone and computer to ascertain the same. 3. West Bengal: Ankan Dey, a 15-year-old teenager from West Midnapore, West Bengal, was the first suspected Blue Whale victim in India. The teenager committed suicide in the bathroom of his house on Saturday morning, August 12, according to reports. While the police are probing if the teen played the Blue Whale challenge, there were reports that Ankan was addicted to online games. 4. Maharashtra: A 14-year-old Solapur boy who left home to allegedly complete a task assigned to him in the Blue Whale game was rescued by the police on August 10 on his way to Pune. “As soon as we were informed by our counterparts in Solapur, we intercepted the bus and rescued the boy, who was on his way to complete a task given by the Blue Whale Challenge game,” a Bhigwan police station officer had told IE.